I have a love-hate relationship with summer. Summer means my birthday, warm nights at beer gardens, yoga at the Georgetown Waterfront, and most importantly ice cream! But for all the good that summer brings me, the heat and humidity can be unbearable...and the AC, while often just what I need after an early morning run, can get really cold in the office. This makes choosing outfits kind of hard. They have to be cool enough to get me to and from work, but also warm enough to keep me cool at work. Luckily, I have some tips that can help for both women and men. Ditch the Cardigan: Unless it gets pretty cool, I leave my sweaters alone in the summer. Instead, I use one of my many lightweight button downs. I'll wear a cotton tank top on my commute to work, but if it gets too cold in the office, I'll throw on a button down shirt. Skip the Sneakers: I walk a lot in DC, so I always keep a pair of sneakers with me. But in the summer, sneakers can get a little bit too warm. Instead, I opt for a cotton oxford shoe or a supportive sandal. They'll keep me cool, and I can wear them at the office and still look professional. Scarves aren't Just for Winter: When you think of scarves, you think of heavyweight wool for those blustery, winter nights. But there are scarves that I wear in warmer weather. Loose and light, these scarves can be paired with many different outfits and come in a variety of styles. 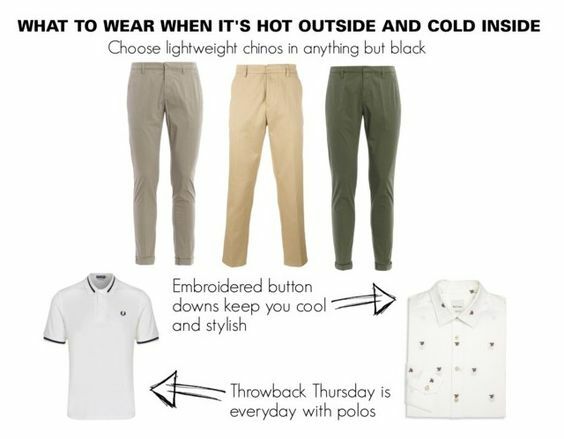 Chinos are Your Friends: Chinos are lightweight and perfect for when you can't compromise on the length of your pants. Just make sure you choose lighter colors that will reflect sunlight keeping you much cooler than black or navy blue. Bring Back the Polo: Polos were really popular when I was growing up, but I haven't seen them as much lately. But they're great for hot summer days and cold offices. Short sleeves, but professional, they can be paired with virtually any color pant. Stay Fashionable with Embroidered Button Downs: Button down shirts can get pretty boring for men, but embroidery can add a unique and unexpected touch of style. 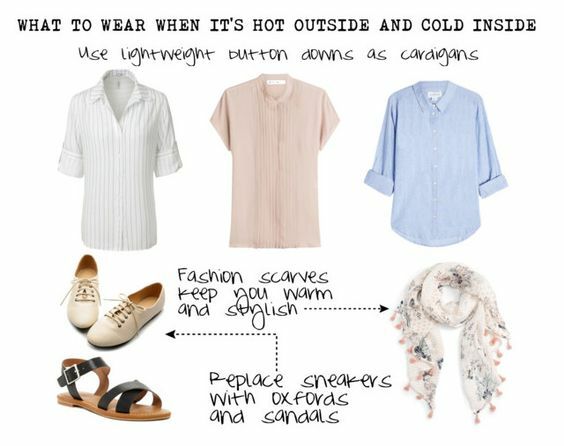 Keep the shirts light weight, to keep you cool outside, and warm inside. Read the Employee Handbook: My job is pretty casual, so while these tips may work for me, they may not work for you. Just read the Employee handbook or talk to HR to make sure your summer attire is up to code. Keep a Sweater or Even a Blanket at Work: If your office is really cold, you may need to keep a sweater, or even a blanket, at work. I actually keep a snuggy at my desk because the temperature has actually dropped below 70 degrees. 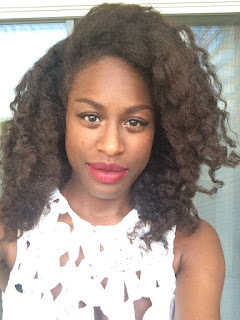 Buy Some Fashionable Bobby Pins: I always keep my hair up in the summer, but I still like my hair to look good. Fashionable bobby pins keep the humidity from destroying my hairstyle, but also give my hair a little touch of bling. Bring a Water Bottle with You Everywhere: Whether you're outside or inside, make sure you're drinking lots of water to keep you hydrated and prevent heat exhaustion. 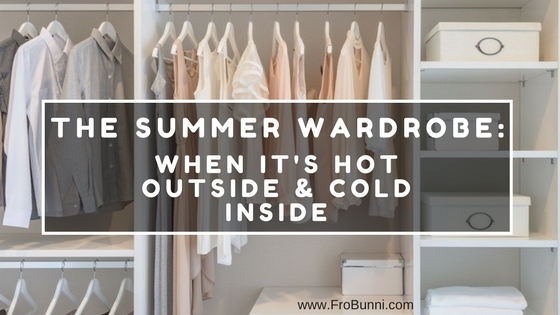 While summer can get pretty confusing when it comes to your wardrobe choices, there are ways to make it easier. Hopefully, these tips can help you stay cool, but also warm during the summer. Where do I Get Vegetarian Recipe Inspiration?